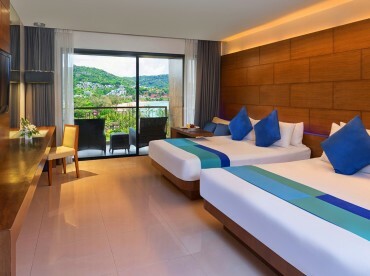 The type of luxury accommodation in Phuket you can expect from a Novotel resort is to be of the highest standard. However, our resort goes above and beyond what one may consider to be luxury with a real modern and contemporary setting. Each of our rooms are crafted to Thai style décor and offer the best modern accommodation in Kata, Phuket. We provide a beautiful selection of room types so depending on your preferences. You can be sure to find the right level of accommodation to fit your desires. Our superior rooms offer the best in amenities, style and elegance with a modern twist. 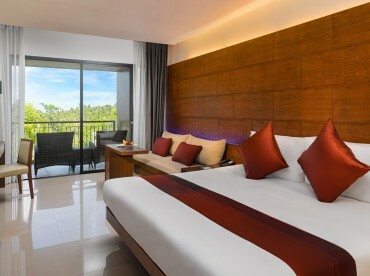 We provide 3 types with a choice of either a King bed for couples looking to enjoy a romantic get away by the sea, 2 double beds and for families looking to stay with us we offer connecting rooms in Phuket that provide additional space needed. In fact, we provide some of the best family rooms in Kata, Phuket that you’ll wish to extend your stay once you experience the mood and feel of your chosen room. For something more memorable and stylish we offer our executive rooms to those wishing to enjoy greater space or looking to stay with us on a business trip. 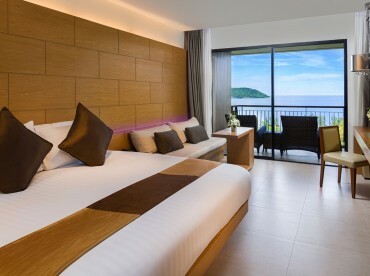 Indeed, these are located on higher floors so you can enjoy some stunning seaview rooms in Kata, Phuket. Observe comfortable beach setting that allows for the ultimate get away from city life. For our highest and top level room type we offer our premium superior suites in Kata, Phuket. That really bring the level of opulence and richness to a new level. Our suites are the perfect way to really pamper yourself. At the same time, enjoy your beautiful stay in the tropical lush surroundings that make up Kata, Phuket. With the additional space afforded to you there is a real desire to want to while away your hours in intimate privacy. Then, enjoy the bountiful space on our balconies overlooking the Andaman sea. Furthermore, each room is designed to give you a real sense of belonging. Whilst you are in the heart of some of the most beautiful surroundings in the world, you will have the feel of being at a home away from home. The private accommodation in Phuket that we offer is certainly something you’ll want to experience. Whether just for a few nights or longer, the majestic beauty seen all around you will be matched with what you have inside each room. Furthermore, no expense has been spared to offer the very best in beachfront accommodation in Kata. All our rooms are offering stunning views out to the ocean. You will not miss a single sunrise or sunset should you choose to witness the beauty each day you spend with us. We welcome you to stay and make your perfect holiday a reality with our team always on hand to assist. Book at least 7 room nights. Book at least 15 days in advance.